Rob / ANN BERETTA went into the studio inspired by Tom Waits “Closing Time” with nine new songs. The first tracks were acoustic guitar and vocals. The rest is history. The album contains 12 songs total. 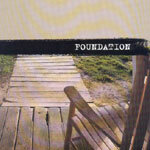 Nine original Foundation songs, two Ann Beretta acoustic renditions, and a Tom Waits cover. Foundation will not only move, and inspire you, but leave you falling in love with the simplicity of the spirit, message, and soul of what happens when you let go, reach deep inside, and find a voice that has been there all along.